Do you know a colleague who is not a member of NCMEA? Would you like to share the benefit of membership with your peers? NCMEA President Elect Carol Earnhardt announced the 2019 NCMEA Membership Drive at our January Board meeting. Between now and Friday, May 31st, 2019 all New and Lapsed* Members who join NAfME/NCMEA will be placed in a drawing for a trip for two to Williamsburg, VA. The trip has been generously donated by Educational Travel Adventures. The trip will include two nights lodging with breakfast at the hotel each morning, a three-hour guided tour of Colonial Williamsburg, a visit to Jamestown Settlement and $150.00 cash allowance. The top three members who recruit the most new or 1-year lapsed members will win Amazon Gift Cards. So talk up NCMEA membership with your fellow music educators, keep track of your list and share the list with Carol Earnhardt. 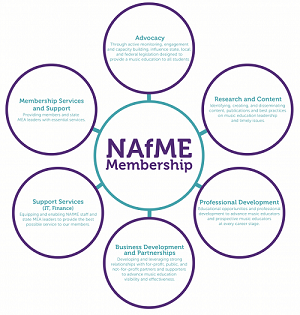 What has your membership in NCMEA meant to you? Have you grown as a music educator because of the activities you’ve participated in and the relationships you’ve built through your membership in NCMEA? We thank you for helping NCMEA Membership grow! * A Lapsed Member is a former NCMEA member who has been inactive for one year or more.